My kids love muffins. I don't know what it is about them, but they down them like candy. I have seen this recipe out and about on the web several times. 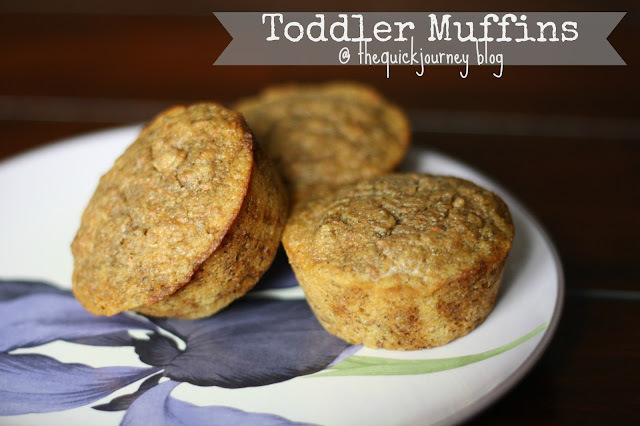 These muffins are moist and full of lots of yummy goodness. Next time, I would double my recipe and make more because they are getting gobbled up pretty quickly. I did make some alterations to the recipe, so if you want to make it the original way- go for it! I don't have a hard time getting my kids to eat fruits and veggies, but if you do, this is a great way to sneak some into their diet. I processed the bananas, squash, and carrots in my food processor to make them pretty fluid as far as consistency. Once they are cooled, I put them in a Ziploc and freeze them until needed. 1. Preheat an oven to 375 degrees. Grease 24 mini muffin cups or 12 standard muffin cups. 2. In a mixing bowl, cream together the butter and brown sugar until smooth. Mix in the mashed bananas, squash, carrots, and eggs. Stir in the flour, oat bran, baking soda, pumpkin pie spice, and salt until just combined. Spoon the batter equally into the prepared muffin cups. 3. Bake in the preheated oven until a toothpick inserted into the center comes out clean, 15 to 20 minutes. Cool in the pans for 10 minutes before removing to cool completely on a wire rack. Store at room temperature for up to two days, or freeze. Hey, new follower from the Friend Connect blog hop. These look delicious! I think I might just have to try them out. :) Thanks for sharing! Stopping by from the Homemaking Link-up. These look great, and I bet they would freeze well, too! I don't have a hard time getting my kids to eat veggies either, but it's nice to find snack foods that are packed with goodness instead of empty calories and too much sugar. Thanks! I don't have a toddler anymore, but I bet these muffins would be a big hit in my house! Thank you for sharing at the In and Out of the Kitchen Link party. I look forward to seeing what you bring next week.